Living with deception all around has made us somewhat jaded in our desire. We’ve been lied to, cheated, deceived or otherwise tricked so often in so many ways by so many people that there is a general “ho-hum” attitude about much of life and living. Many have lost their sense of excitement or adventure about life, and have opted for the “go-with-the-flow” approach. Why? Because this attitude allows the deceivers and seducers free rein in a society that is lacking in discernment. The skill of discernment has been mercilessly attacked and beat into almost a non-existent state by our politically-correct, perpetually offended crowd. Discernment requires discrimination, but we’ve been told that discrimination in any form is against the law. Acting on discernment will often appear as being suspicious, because there are no visible facts supporting the decision. 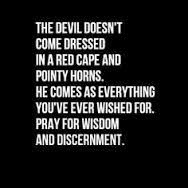 Yet, discernment is the one skill necessary to avoid the traps often set by those who would deceive. Please note that it is a SKILL of which I speak. Many Christians have stopped with the idea that the “discerning of spirits” mentioned in 1 Cor. 12:10 is a gift which only a few possess. While this may well be a gift that not all possess, discernment—in and of itself—is a skill that all should possess. Of whom we have many things to say, and hard to be uttered, seeing you are dull of hearing.For when for the time you ought to be teachers, you have need that one teach you again which be the first principles of the oracles of God; and are become such as have need of milk, and not of strong meat.For every one that uses milk is unskillful in the word of righteousness: for he is a babe.But strong meat belongs to them that are of full age, even those who by reason of use have their senses exercised to discern both good and evil. These dull-of-hearing people are likened to babies who cannot chew and digest a steak. “Strong meat” in this case refers to the spiritual understanding that would link Melchisedec and Jesus. It should be obvious that the writer expects all believers to become mature, even though that is clearly not the case with this group at the time. This verse needs to be broken down into its component parts in order to see clearly what is being called for, which I will do in the next article.